Defining a Website is the key to file management in Dreamweaver (see Chapter 1, pages 43 – 45). The first thing you will do when working with Dreamweaver is to define a site. Defining a Site tells Dreamweaver where all your files will be stored for your site. Without a site definition, Dreamweaver may run into difficulties linking or organizing your files & images. You must define your site on every computer you use Dreamweaver with in order for Dreamweaver to associate web pages, images, and related files to a site. You should always avoid working on individual files “outside” of your site(s). Always choose the correct site before opening or creating in the Files Panel. Eventually you'll have lots of files: web page, images, CSS files, and other types of files. Create a Home (root) directory to store all files for your website (only required once) Before telling Dreamweaver where site files are located, we must build a home directory for your website. This directory will store files for your site, and you'll build a logical structure beneath it with directories for supporting files such as images, scripts, and style sheets. Many beginning web developers simply start making web pages, skipping the site definition step—this is a major mistake when using Dreamweaver. You'll make your web development life easier by completing this important step before any development takes place. Every website has a root directory. The root of a website is the main directory that contains files and other directories. When you define a website, Dreamweaver considers that root directory and all the files (or sub-directories) within it to be the entire universe of that particular website. Define your site(s) in Dreamweaver (only required once per computer per site) Dreamweaver needs you to define your website so that it knows how to find and link the pages, images, and other files of your site. 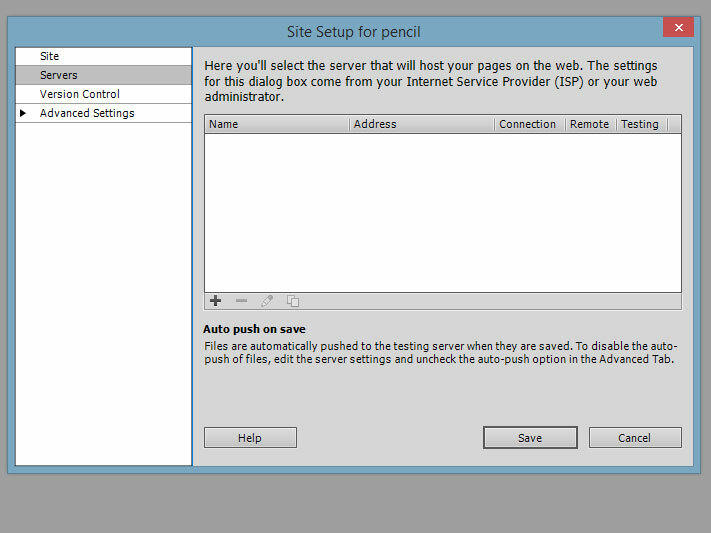 To begin defining a website, open the Manage Sites dialog box by selecting Site / Manage Sites. The Manage Sites dialog box is where you can create, edit, duplicate, remove, export, and import Dreamweaver site definitions. The title says it all: This is where you manage your websites. 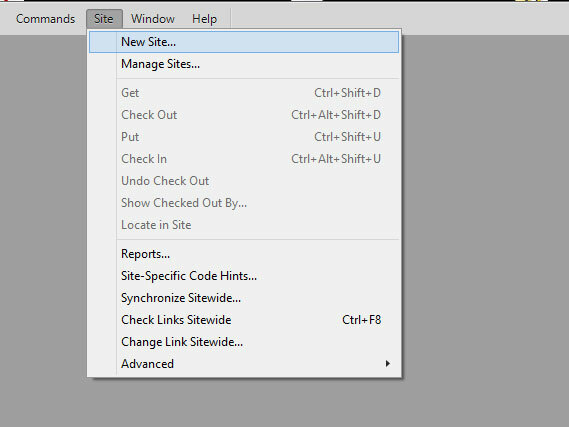 To begin defining a new site, click the New Site button in the Manage Sites dialog box and choose Site. The Site Setup dialog box allows you to name your site and select your “root” web directory. In the Site Name field, I recommend you enter the name of your web site. This may be uppercase or lowercase and contain spaces. It is simply a name for Dreamweaver to call your website. For the Local Site Folder, click the “Browse for folder” icon to the right of the field. Then find your site’s “root folder”. If you do not have an existing folder for your site, then create a new folder for your site. .Every student in cs952 has their own personal subdomain at the cs952 website. This is the address to the remote server you will be using. You will upload your assignments to your subdomain, then go online to your subdomain to view your website on the internet. You must use this website for all website assignments for this course. Your subdomain web address is based on your first name, plus the first letter of your last name, followed by ‘.cs952.org’. Let us take the example of a student named Jose Garcia. To access the remote server, we will use ftp, or file transfer protocol. This ability is built into Dreamweaver. You will need a ftp username and password. All students in cs952 have a unique user name and password already created for you. Your username is based on your first name, plus the first letter of your last name, followed by ‘@cs952.org’. Username is different from your subdomain. Your user name uses the “@” character in place of the ‘.’ Your username resembles an email address, but it is not an email address. The password for Jose Garcia is: 880123456jG! Click “Servers” from the categories on the left of the Site Setup window. To add a new server to host your site, click the “+” icon (“Add new server”) to open a dialog box similar to the one shown here. 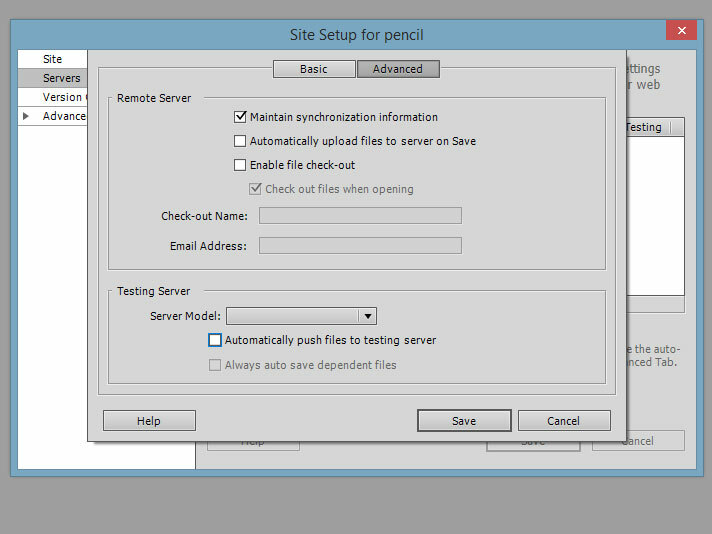 Switch to the “Advanced” tab and UNCHECK ‘Automatically push files to testing server Advanced. Switch to the ‘Basic’ tab and enter information as described below using the User Name and Password described in the instructions above. Click “Test” (below the password field) to verify the Server settings are correct and Dreamweaver is able to access your Subdomain. If the test is successful, click the “Ok” button. If an “FTP error” message appears, check your settings including the password to make sure there are no typos or missing information. 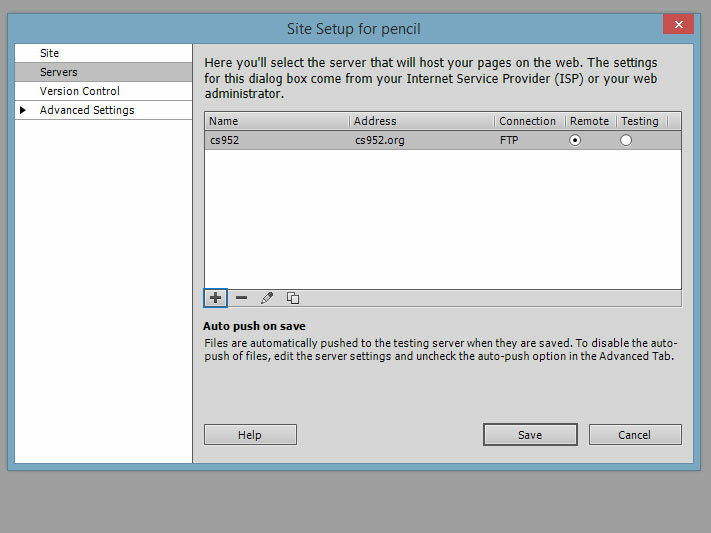 Click "Save " to save the server information and close the New Server dialog box. Click “Save” to close the Site Setup window. Click “Done” to close the Manage Sites window.